How do I create searchable metadata tag fields? As you build curriculum, it is important to ensure you and other course authors can find it quickly and easily. One way to do that is to tag content and activities with metadata that you can use when searching your library. First, you need to set up metadata fields for each domain and subdomain. Once created, these fields appear as either text-entry or dropdown search filters in the Digital Library when you select the domain as the desired Collection. Open and close your field list with <itemmetadata> and </itemmetadata> tags. Open and close each metadata field that you create with <Value> and </Value> tags. id: This value is used in the search. It must be alphanumeric, only, and begin with "meta-". 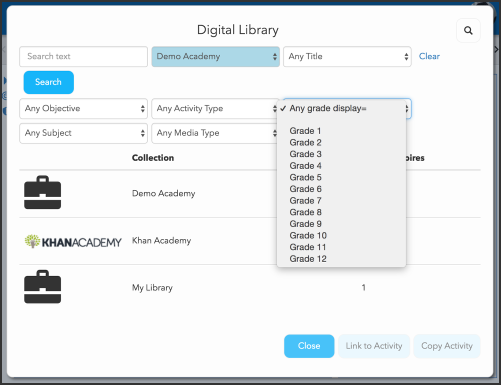 display: This value acts as the field's title in the Digital Library. Text-entry box, in which case you don't need to provide any additional information. See the meta-keyword entry in the example below. value: The alphanumeric only value that is used in the search. display: The value displayed in the dropdown. To tag content and activities, you have to create metadata fields that you want attached to items (folders and activities), and content authors can use them to specify tags as they build. 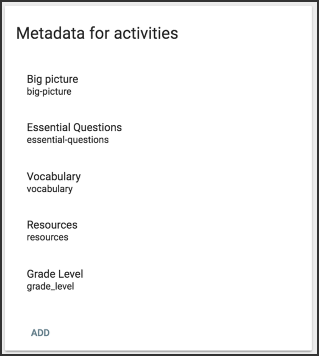 Click Add in the Metadata for activities card. A Name, which is not visible to the users and cannot include spaces or special characters. You can use underscores or hyphens if you don't want the field to be searchable. A Title, which is visible to students. Choose Input Type from the options listed here. The content entered in these fields is used to create searchable metadata tags, so it's important to be deliberate about your choice. Use the Default field to define the default state or content that you want present in the field (this is not available for the Rich Text input type). 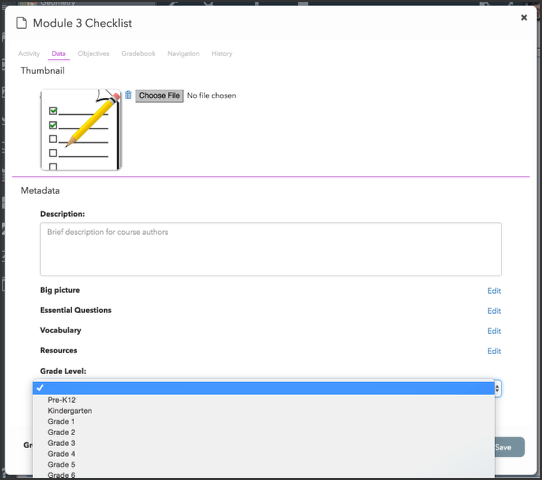 Indicate the Levels within the course folder structure at which you want this metadata displayed. 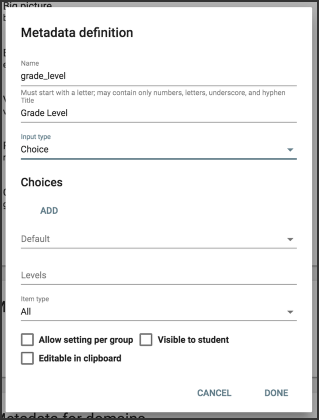 Level one is the first level of folders under the course folder, level two impacts any folders or activities you add to those folders, and so forth. If you don't specify here, the field is shown at all levels. 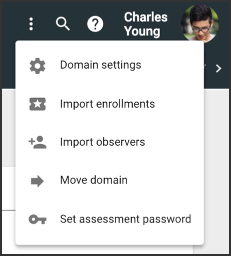 Choose the Item Type for which the section should appear (folders, activities, or all). Indicate whether you want to Allow setting per group. Indicate whether you want to make the item Visible to student when they select the item in the Activities tool (only applicable to folders). Indicate whether you want to make the item Editable in clipboard. Create a new folder or activity, or click the pencil (edit) icon to add tags to existing items. Select the Data tab in the activity editor. Find the metadata field you created, and enter or select the searchable tag. 1. How can we create a consistent metadata grammar across a hierarchy of domains? Do subdomains inherit searchable metadata items from their parent, or is there another mechanism? 2. Could you give an example of the `putitems` command based on the grade-levels metadata example above? Say, a new folder tagged for Grade 10, and a new item tagged with keyword "Pluto". Concrete examples are helpful. 3. Aside from `putitems`, can searchable metadata be applied to course entities as well? If so, I presume it's `createcourses` and `updatecourse` to add metadata to a course? Excellent questions. We've updated this article to reflect the answers where necessary. The XML file needs to be uploaded to each domain and subdomain in order to generate the fields in the library. We've added examples and corrected an error in the description of the [NEWDATA] field. UpdateCourses can be used to update metadata on Courses (https://api.agilixbuzz.com/js/docs/#!/Concept/FreeFormXml). Let us know if you have any further questions or need more information. Can you give an example of activity metadata using a dlap get command?